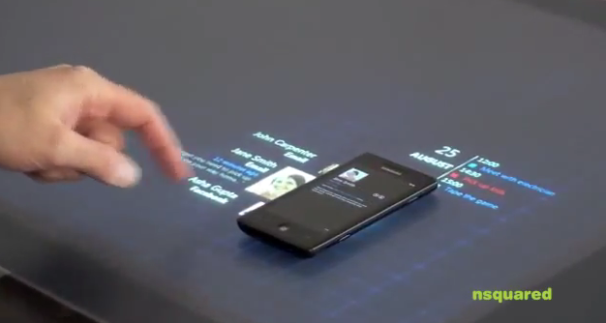 Interacting with Minority Report finger gloves and holographic screens might still be a ways away, but moving files from device to device is something we can do right now. But it’s not instant; there are still the archaic download bars on with an Air Sharing app or you have to do the process manually through Drop Box, why can’t a file just instantly stream like media through AirPlay. A Sydney Studio called Nsquared has developed seemingly magical "Seamless Computing" software that lets you tie together a Windows Phone 7...phone, Microsoft Surface, Windows 7 tablet, and a Kinect-powered television. In the demonstration video, Dr. Neil Roodyn opens a email on his phone and reads it on the surface, pulls up architectural plans on the surface and overlays another view using the slate, then he brings the design plan from his slate to a Kinect powered television to navigate a 3D model using gestures and render new assets from photos taken by the slate. The whole thing is for an architectural build but imagine moving seamlessly from device to device, no file management, instant transfers--that’s the kind of magical interface we dream of.